The Thai people sometimes jokingly liken the face of someone who is, mildly put, deficient in aesthetics to various fermented soybean products, the most oft-invoked of which is fermented bean curd (เต้าหู้ยี้). 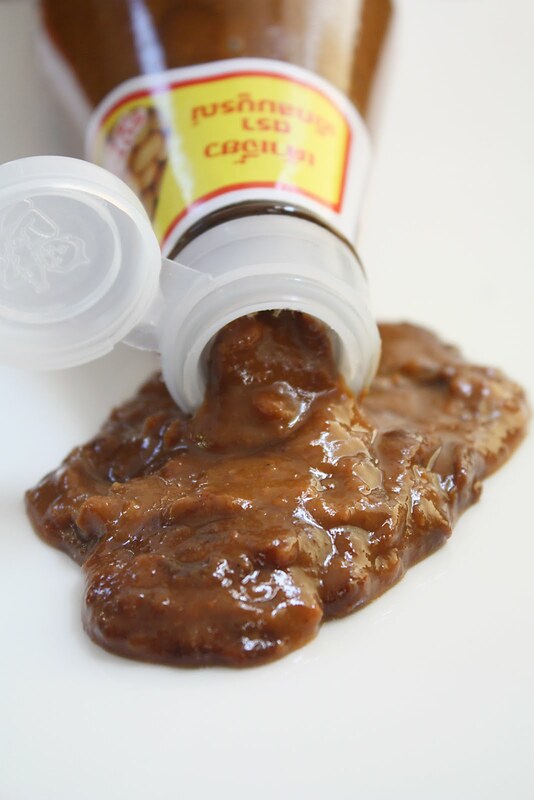 A less frequently-used variation that I can think of (and perhaps have been at the receiving end of such comparison) is this thing presently gracing your screen: salted/fermented soybean paste/sauce. Why? Well, look at her. Not exactly Helen of Troy. But don’t be so quick to spurn this gooey brown dame for, oh, she’ll decorate your life in ways you perhaps would never imagine.True, the face of tao-jiao (เต้าเจี้ยว) has better chances of launching a thousand insults than ships, but if you’re a fan of Rad Na, Pad See-Ew, Khao Man Gai, or other Thai dishes with Chinese influence, then this brown, gooey face has surely shown itself on your plate before. The use of tao-jiao in Thai cooking goes far beyond the aforementioned dishes making it a staple in a Thai kitchen. This is why I felt the need to create this post as part of the Stock Your Thai Pantry Series. Tao-jiao is a popular condiment throughout Southeast Asia. They are used either on their own or mixed with other ingredients such as garlic, chillies, or ginger. The sauce is made from cooked soybeans which have been heavily salted and stored in large jars. Addition of wheat and a fungal starter causes the salted soybeans to ferment over time. The top layer which has turned black in the process of fermentation is removed and discarded at the end. The light brown beans underneath is pasteurized and bottled. Tao-jiao is very salty, and when a recipe calls for it, you should pay attention to the amount of other salty ingredients which are also to be added to the same dish. I’m sure degrees of saltiness differ among the various brands, but I’ve never done a taste comparison. The only brand I’ve used is Healthy Boy, but it’s mostly because I grew up with that little boy in red onesies holding a bottle on the label and it’s too late to break that bond now. In Indonesia we also use this condiment. We call it Tauco. I haven’t used this for quite a while. Thanks for reminding me to use this delicious condiment. I’ve never used this paste before but will look for it, thanks for the info. I use it in my Thai cooking, but it is easy to over do. I usually start with 2/3 of what the recipe calls for and go from there to taste. Telling someone they look like a lumpy brown sauce is quite an insult! I’m going to have to get me a bottle with the boy in the red onsie on it. I love Haineses chicken, but have never made it, nor have I tried this soy bean paste yet – mainly from lack of opportunity. My fridge is full of sauces that I have no idea of the primarily purpose but they looked very intriguing. Love that phrase “deficient in aesthetics”. I must use it soon. We call this tau chu, adds so much depth and flavour to a dish. I always have a bottle of this in my kitchen. Well, I’ve died and gone to Thai heaven. My favorite Esan restaurant around the corner just closed and I’ve been recreating favorites ever since. Thanks for the Red Boy recommendation since I’m attempting a recipe soon that calls for it. Glad to have discovered you (via Zen Can Cook). Leela, I’m impressed at how that Healthy Boy fermented bean sauce appears to be easily flowing out of the bottle in your picture. I have to fight with mine (same brand, same bottle) everytime I need to extract some sauce out of it. I spin the closed bottle in a wide circle in order for the stuff to reach the opening, I wiggle a skewer in the bottle to loosen the sauce, but even then it’s a struggle to get the damn stuff out! Am I alone facing that frustrating situtation? Jean-François – The temperature or the length of time it has been sitting on the store shelf could be a factor. Try loosening up the sauce a little by sticking a chopstick into the bottle through the opening and swirling it around a few times. Is this the same as yellow bean paste? Belle – No, it’s not, and the two are not interchangeable either. My local asian store didn’t have the sauce, but they had fermented soy bean chunks in a jar immersed in a liquid. Is this the same thing, just not mashed up? theWaif – That’s fermented soybean curd (tofu) which is different from this. The two are not interchangeable. And there’s no substitute for either one. You say this is used in Pad See Ew, but it’s not in YOUR recipe…how would I use it in PSE? (continued) to the recipe, reduce the oyster sauce to one tablespoon, and reduce the soy sauce to one teaspoon. Is this from yellow soybean? So far, I’ve only had luck finding black soybean paste and I assume there is a difference in flavour?! Angela – This is made from yellow soybeans which is fermented until they turn dark brown. There is a difference in flavor which is more noticeable in some dishes (e.g. khao man gai sauce) than others (e.g. stir-fries).